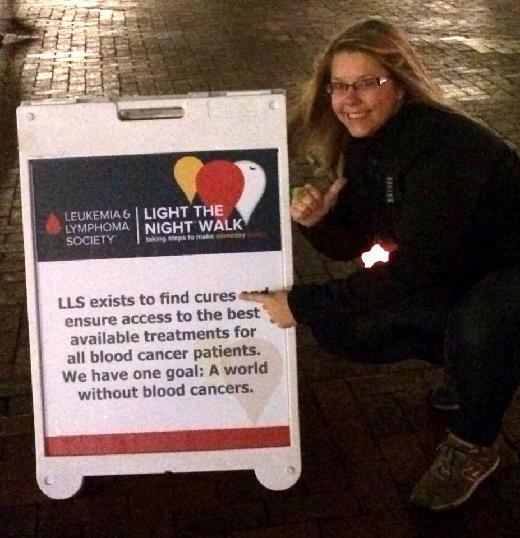 Welcome to my Light The Night Walk Fundraising Page!! I have woven in some facts with my story. I hope you find it informative. Can you believe it? My type of blood cancer, Chronic Myeloid Leukemia or CML for short, has gone from an average life expectancy of 5-6 years in 2001 to me being in remission with one pill a day. 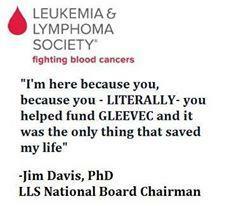 How lucky I am that people like you donated to LLS before I ever new I would be diagnosed with cancer. "One pill a day for everyone." That is what Dr. Brian Druker said ~2001 when Gleevec, the first generation drug that I'm on, was put into clinical trials and would change the landscape of cancer treatments forever. DID YOU KNOW? 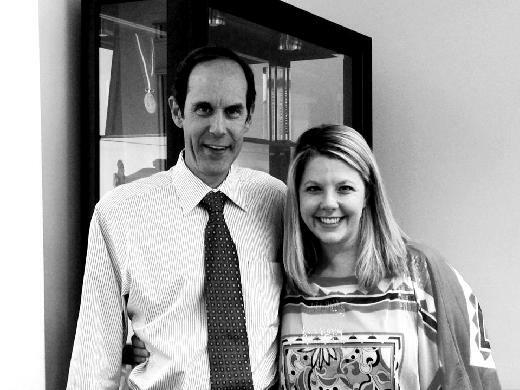 Dr. Druker's research, which has been funded by LLS since 1996, saved my life...literally. That's a picture of me with him when I went to see him in his office in Oregon. I may have cried. #myhero He does research and still sees patients. HIGHLIGHT: The Leukemia & Lymphoma Society (LLS) has made some incredible breakthroughs possible in recent years. One is a targeted therapy for Acute Myeloid Leukemia (AML) patients that my above hero, Dr. Druker and his team are researching. YOU help fund everything that LLS helps fund. This and all of the other research made possible through LLS grants have already begun to change the lives of thousands of patients like ME. If you want to know more about the journey that led to my chemo being only one pill a day, pick up a copy of The Phildelphia Chromosome. If you do, you'll see what CML patients went through before life altering, life saving research changed it all. LIFE SAVING RESEARCH paid for by generous people like you. Treatments that can manage a person's condition with a daily pill, therapies that seek out cancer cells and kill them, and the use of a patient's own immune system to eradicate cancer...that's happening TODAY... not someday, but today. THIS is why I #walk4LLS. What you read above is me. It is a story of hope that began 18 years before that ONE PILL A DAY happened for me. That ONE PILL A DAY happened ten years before I even knew it existed or would literally save my life. Saving my life did not happen over night, and it did not happen without people, friends and family like you. People who believe in the fight against cancer and are willing to donate to help fund the fight. Some who donated before they even knew a person in their life that would benefit from it. Like two of my cousings who did an LLS Team in Training event a few years before I was diagnosed. It will be SIX years in a few months that I was diagnosed with leukemia. When you're on a drug like this, one that is so easy and that doesn't really alter the way you live, it's easy to take it for granted. Last year, I decide to take a break from the medicine after reading that 50% of patients may be cancer free after five years. I had been in molecular remission for most of those five years, so I took a shot. On my two month check up, I learned that after only that short time of being off my medication that my cancer was indeed back and on a molecular level. My doctor made me go back on the medication immediately and was a little concerned at how quickly my levels rose. My first reaction for sadness, but it quickly went away when I rememebered just how lucky I am. I have a chemotherapy drug that by taking it once a day, my cancer is literally prevented from forming in my body. That is definitely something for which I am grateful. As unreal as it was six years ago to get diagnosed with leukemia, to make those late night phone calls to my parents to give them the news, it is just as unreal to believe that cancer treatment has come so far that I can live a happy healthy life. THIS is why I'm #Relentless4theCure. THIS is why I am asking you to donate to fund the fight against this terrible disease. What a change your donation has the power to make in someone's life! I honestly can't thank you enough for your support. It means so very much! "Way to go Reagan! Thank you for all you do to raise funds and awareness for leukemia research!" "My strong, courageous, determined, loving, kind and considerate baby sister. She has and will continue to keep stepping to make life better for everyone!!! We love you!!" "You rock, my awesome cousin! Love you!"